NASA's New Horizons probe, nine-and-a-half years outbound from Earth and less than two weeks from a historic flyby of Pluto, went into protective safe mode Saturday afternoon after experiencing an on-board anomaly, the space agency reported. The spacecraft's autopilot, as programmed, switched over to a redundant flight computer and began transmitting telemetry to Earth to help engineers troubleshoot the problem. The spacecraft was out of contact with Earth for one hour and 19 minutes. An anomaly team was assembled to analyze the glitch but given the probe's enormous distance -- it takes radio signals nine hours to make a round trip -- it likely will take "one to several days" to restore normal operations. "The mission operations center at the Johns Hopkins University Applied Physics Laboratory lost contact with the unmanned spacecraft -- now 10 days from arrival at Pluto -- at 1:54 p.m. EDT, and regained communications with New Horizons at 3:15 p.m. EDT, through NASA's Deep Space Network," the space agency reported Saturday evening. "During that time the autonomous autopilot on board the spacecraft recognized a problem and -- as it's programmed to do in such a situation -- switched from the main to the backup computer. The autopilot placed the spacecraft in 'safe mode,' and commanded the backup computer to reinitiate communication with Earth. 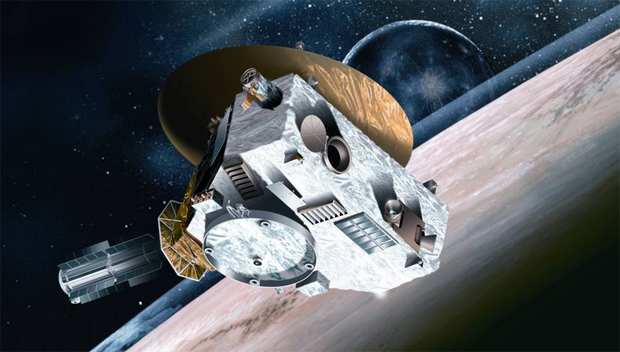 New Horizons then began to transmit telemetry to help engineers diagnose the problem." NASA said the anomaly team was working to return New Horizons to its original flight plan. New Horizons is expected to pass within 7,750 miles of Pluto on the morning of July 14. Following a pre-programmed sequence of commands that were uploaded last week, the spacecraft will aim itself and its instruments at Pluto and its large moon Charon for the first close-up looks at the distant worlds. Because of it takes radio signals four hours and 25 minutes to cross the 3-billion-mile gulf, real-time commanding is not possible and New Horizons must carry out its observations autonomously. The spacecraft is equipped with multiple backup systems, including redundant flight computers, navigation equipment and data recorders to help it recover from major problems. But with New Horizons finally closing in on Pluto, engineers want to make sure the spacecraft doesn't experience any problems that could interrupt science during the one-in-a-lifetime flyby. NASA did not provide any details about what might have triggered safe mode Saturday, but promised updates as more information becomes available.